There’s a scene in some little bar that Steve McQueen’s John Reese isn’t supposed to be at where he’s getting himself some firewater and the barmaid is saying that he’s going have problems when the MPs find him there. “Are you looking for trouble?” she asks. He pours himself another and says “the world’s full of trouble”. And there’s no way you could argue with that, I thought. Especially since some shell-shocked combat burn out who only goes crazy when he’s not in battle is saying it! Is Reese just a World War II version of Rambo? Not exactly, but the words “instant classic” popped into my head as soon as Reese reported to his new outfit and his new Sergeant, Bill Pike, knows who he is and the captain relates that the background on how Reese lost his stripes is that he stole a jeep and almost ran over a colonel before wrecking it! It’s late 1944 and our boys are valiantly fighting it out with Jerry on the Siegfried Line. Looking at some of my old maps from the tour I did with the 63rd Infantry Division (you couldn’t ask for a better bunch of guys to kill Krauts with) it looks like this Siegfried Line was somewhere in Europe. Hell, it didn’t matter where we were at, so long as there were Nazis to blast! 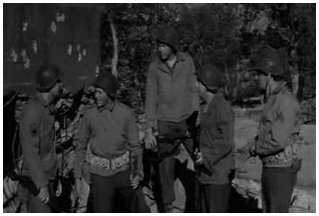 There’s a big rumor going around that these guys are about to get shipped home, but once they transfer in the burnout who only is sane when he’s on the front lines, I would have been thinking that maybe we weren’t’ going to be heading back to Mayberry quite yet. Pike tells Reese in confidence that they aren’t going home, that they’re going back on the line to relieve the guys already there. Reese’s only reaction is to sit around cleaning his weapon and double checking to make sure that it will still go through the Germans like a psycho dog face goes through a bottle of whiskey the night before battle. They go up to the line and take up positions and later that night Pike gets the order to move everyone out except for about six guys because of some German counterattack they anticipate up the road. It’s pretty much him and five grunts against the entire Reich. Reese knows that they’re screwed if the Germans figure out that they’ve basically got have a basketball team holding off a column of Panzers. Outmanned and outgunned, what’s Reese and company to do? Enter Bob Newhart! 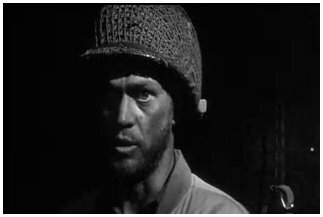 Playing Private James Driscoll, a scared typist who is trying to deliver a vital reinforcement of typewriters to some general, he ends up having his jeep commandeered and put on the line, though he doesn’t even know how the safety works on a rifle. You’ve also got James Coburn playing the mechanic that all movies like this one has. You know, the guy that can rig anything up with spit and bailing wire. This time, he rigs up the jeep to backfire so that it sounds like a tank. They know that they need to trick the Germans into believing that they have a full compliment of forces so that the Germans aren’t trying to overrun them in the middle of the night. They have guys drive the jeep around in low gear and backfiring. They also manage to rig up a bunch of empty ammo cans and wire so that they can jiggle them from afar and make it sound like they’ve got guys out in the forest patrolling the perimeter. They even manage to work Newhart’s classic phone call gags in! In spite of their efforts, the Germans attack that night and there are casualties on both sides. The action here is pretty graphic with Reese stabbing people, guys set on fire and people screaming as they die. Following that night’s action Reese figures that unless they take out this pillbox that keeps them pinned down, they’re hosed. It’s all tense manly action once the two assaults on the pillbox occur. 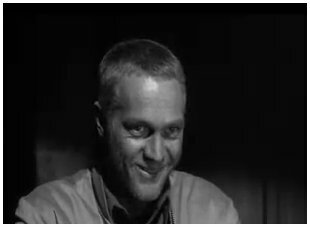 McQueen really lets loose in this part of the movie, becoming visibly unhinged, looking about a hundred years old and shaking uncontrollably in some scenes. When people die in this movie, they don’t die easily. In one particular scene Siegel uses an overhead shot to swirl above some guy who ate some lead in the stomach and this guy is just screaming about his guts over and over. The camera hovers over him like we’re having the dying guy’s out of body experience. With a cast of familiar faces (Coburn, Fess Parker, Newhart, Bobby Darin, Nick Adams, and Harry Gaurdino) backing him up, Steve McQueen is all the more effective since he doesn’t have to appear in every scene and when he does appear you can’t help but be transfixed by this fatalistic look he’s wearing like some kind of stubble-ridden death mask. 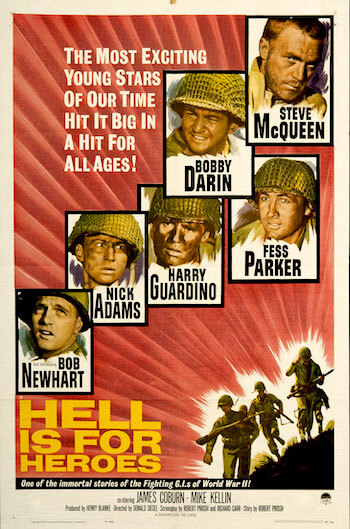 An involving and hard hitting tale of battlefield action that shows us the bravery and sacrifice these men made without sanitizing or glorifying it.